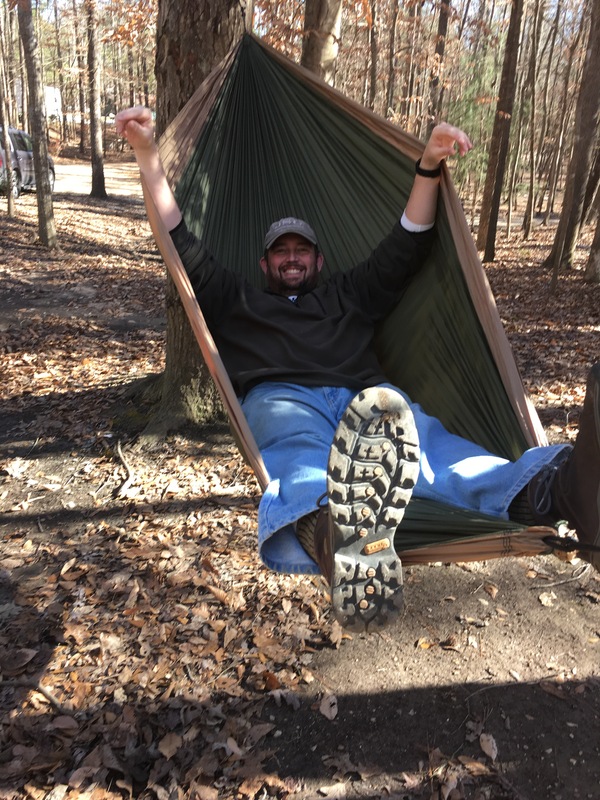 This weekend’s hike keeps me close to home, Chewacla State Park. This will be my first overnight trip and a good opportunity to test out my gear. I have some new items and a few older things that I wanted to test before going completely off the grid. I picked this hike strategically. The park is only a couple miles from my home. If my new tent has a problem, I can be home in bed in 10 minutes. Likewise, if my new stove fails, I can be at the local Jim & Nick’s BBQ in 5 minutes. I had to get a new tent because my previous tent was too big to pack. 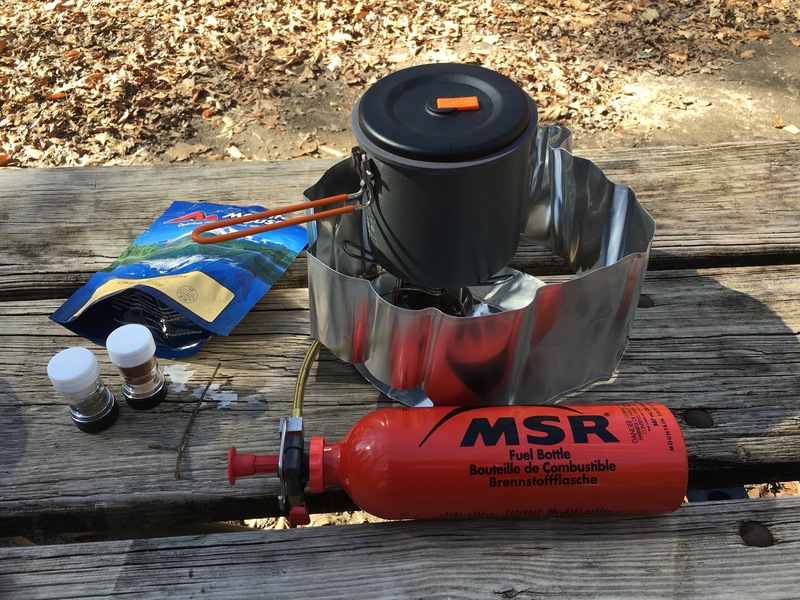 I also had a MSR Whisperlite stove that I’ve never used. 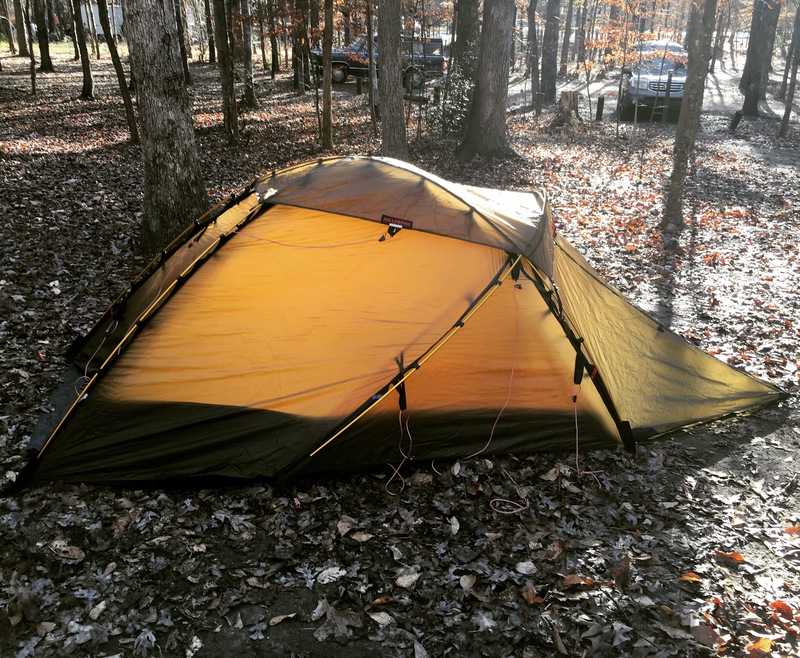 I was able to set up the new tent in about 15 minutes. Fortunately, the stove started right up too. 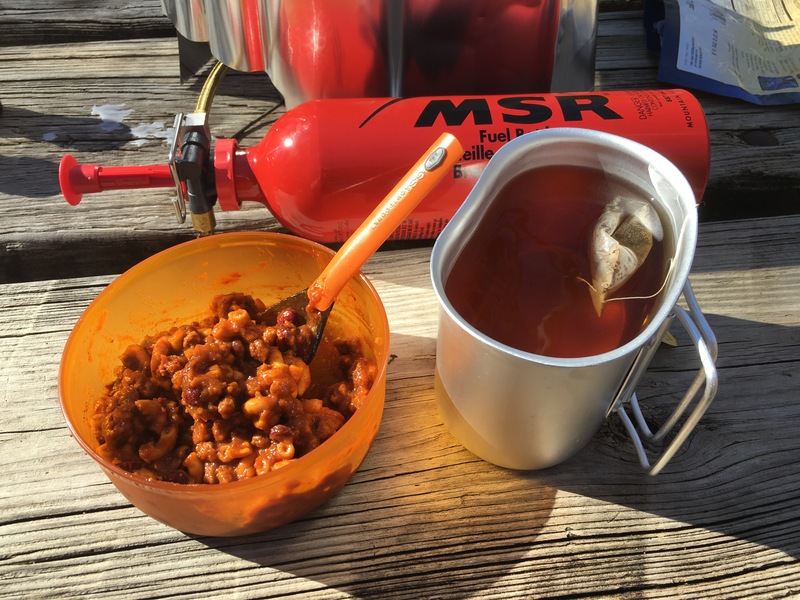 I prepared a nice lunch of Mountain House Chili Mac for both of us. Mine was paired with Earl Gray tea from my comfort kit. Meg’s was with Kool Aid. I can happily report that lunch was great and everything worked perfectly. I also have a MSR water filtration system that won’t be tested this trip. For my local friends, it might be a good time for Dr. Lall to study up on Alabama intestinal parasites 😁. Most of my local friends are familiar with this park. 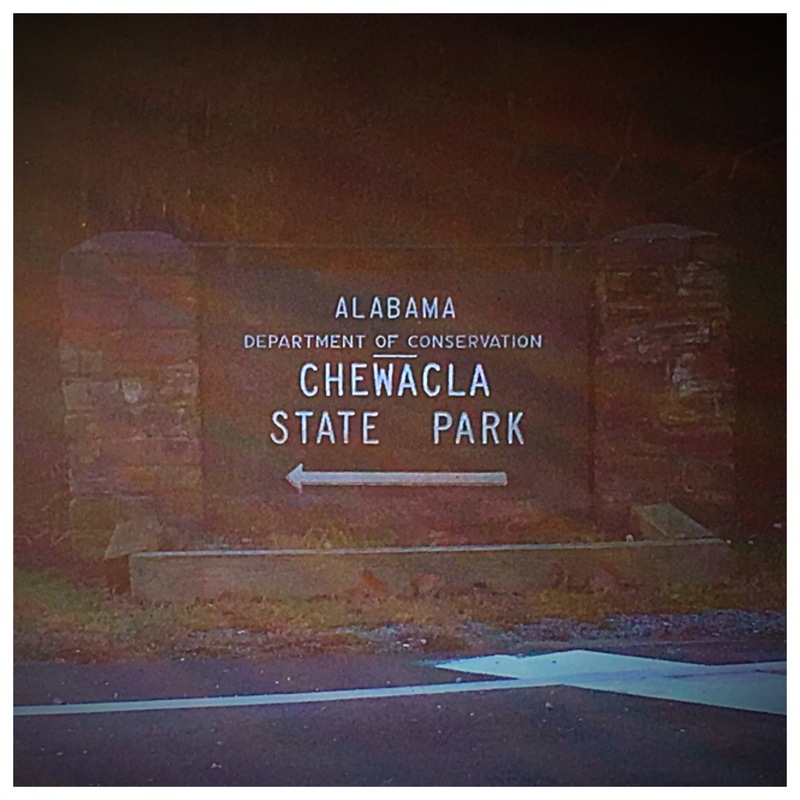 For those that aren’t, Chewacla is roughly 700 acres and was built as part of the Civilian Conservation Corps program (CCC). The park has a nice lake and numerous trails suitable for hiking and mountain biking. It also has rock cabins, improved and primitive campsites. They are very popular during football season. 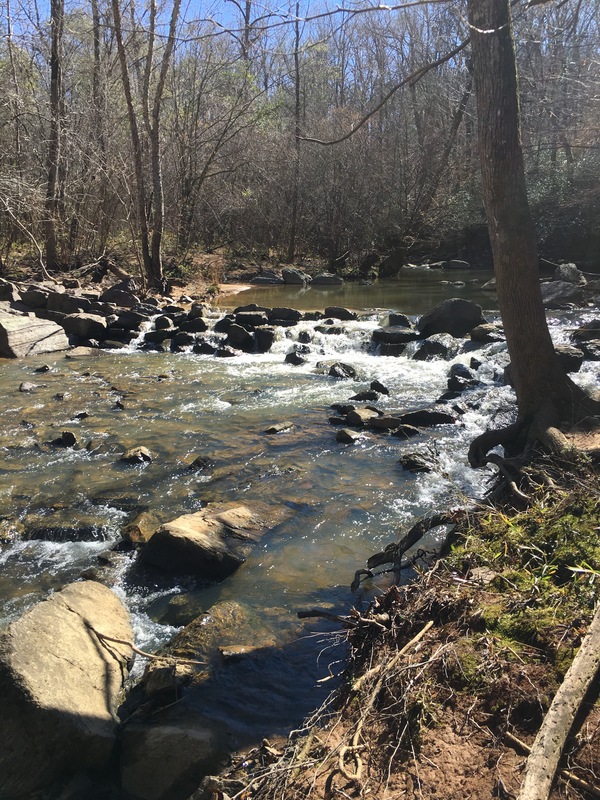 Chewacla is known for it’s waterfall, which is a CCC built dam that the lake empties over. 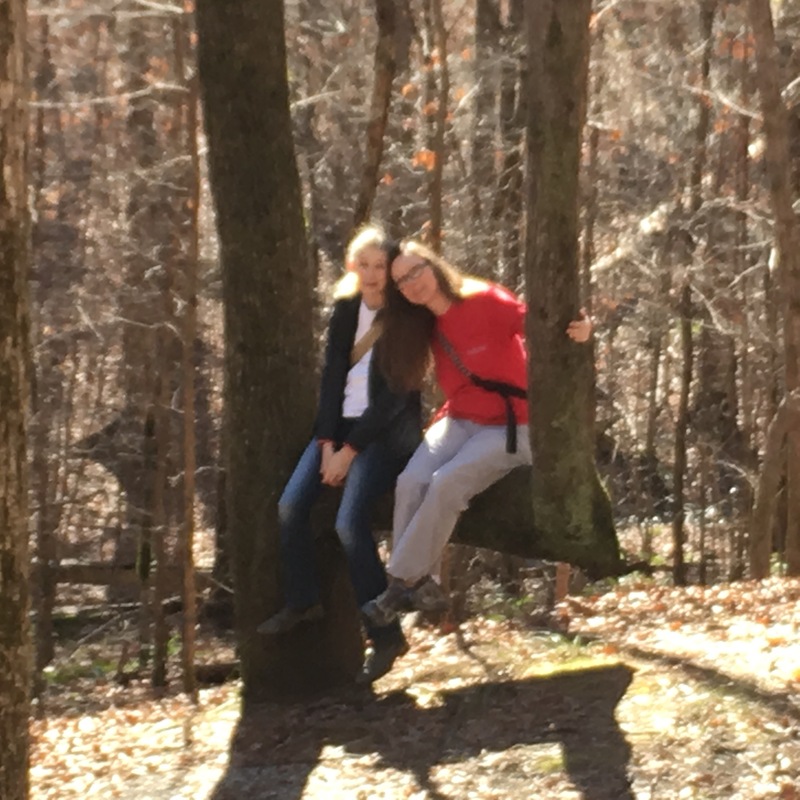 We hiked 2.5 miles of the trails mostly along the lake and Chewacla Creek. This was the first hike I would call moderate. After a sharp drop to the waterfall, it is relatively flat. I think most could happily hike here. The trail follows the creek before turn back through the woods to the parking area. There were some areas where the recent flooding washed away the trail. Follow the creek and you will pick back up on the trail. We found two geocaches along the trail (even though we were not looking). 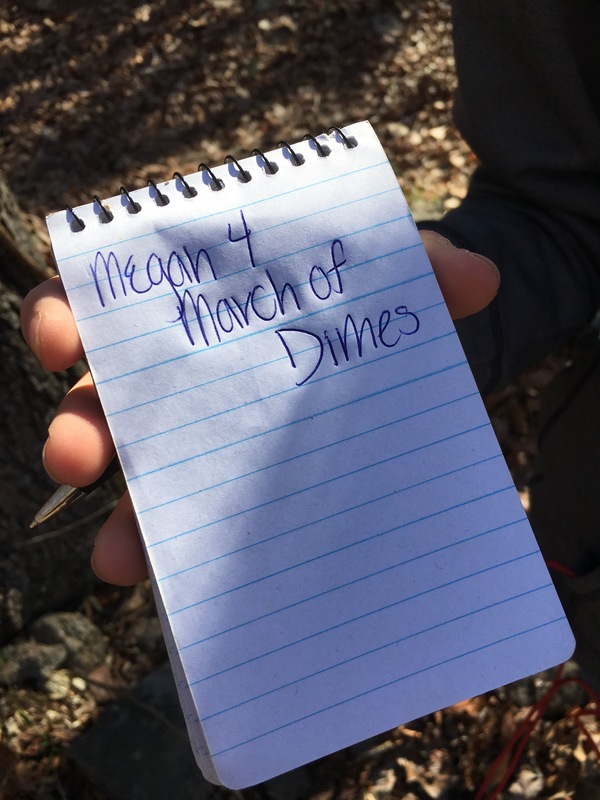 Meg took the time to sign the log book. I was also able to practice my bush crafts. 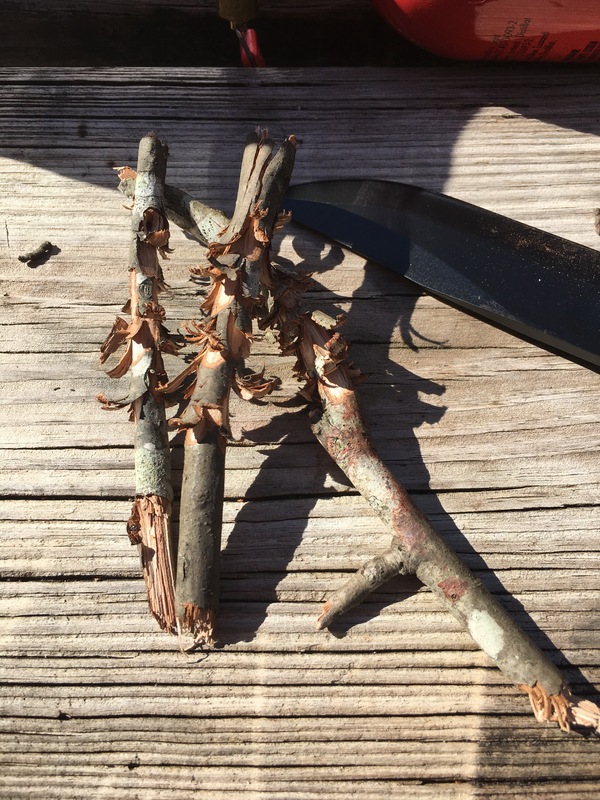 I made a few feather sticks to start a fire tonight. Our March for Babies campaign had a very good week. We are now at $3,038 towards our $15,000 goal. We received a donation from Oklahoma this week. That possibly sets a record for the donation traveling the greatest distance. We still have much work to do, but the progress feels good. 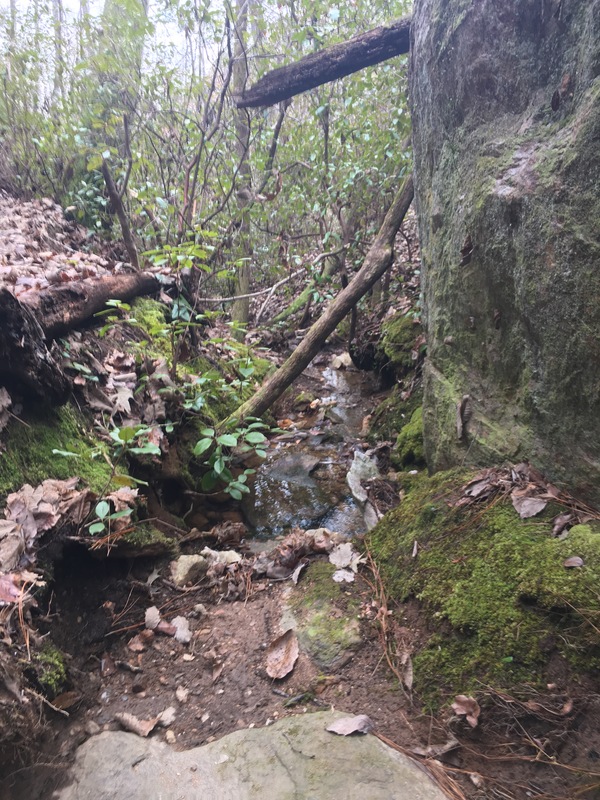 For my third hike, I chose the Little Smith Mountain trail. I was given some advice that this was the more scenic of the trails and scenic it was. The trail begins at the same trail head as the Smith Mountain loop. I didn’t go backwards this time. The trail proceeds towards the tower but branches off, circles around the back of Smith Mountain before ascending a slightly smaller peak beside Smith Mountain. The geology was identical on both hikes. This trail was not in my “Hiking Alabama” book hence the n/a in the title. The views were incredible and I suspect it was built after the publication of the book. The trail was roughly 2.5 miles and also steep. I truly felt like I was preparing for the Inca Trail on this hike. Much of the hike was at the very edge, literally within feet, of a 100 plus foot bluff. I had to once again conquer my fear of heights. I paid close attention to my footing. The trail had a lot of broken gravel and stump holes. This would not be the best trail for small children or pets. It did, on the other hand, offer spectacular views of the lake. There were also several benches placed in just the perfect spots to rest and enjoy the view. I was told these were place as an Eagle Scout project. I took full advantage of each one. They were a great place for photography. Once at the peak, you can see the fire tower across a deep valley. Ironically, both mountains had damage from a forest fire. There was a large amount of dead, standing timber. Many of these trees had woodpecker holes. Nothing goes to waste in the forest. Both the trail up and down did go through more forest than the fire tower trail. You cross a couple of small streams in the path. You also walk along a feeder stream as it empties into Lake Martin. I must confess to a couple of points. I did not take my pack. After the Smith Mountain climb, I was just not up for more this weekend. I also got a little lost at the end of the trail. The trail did reach a point where it was unclear where to go next. The trail blazing just seemed to stop. I knew about where the car was (I had my GPS), so I went off trail over a small ridge. Fortunately, the trail blazes were just on the other side. I finished without incident. Between the two mountain hikes, my iPhone gave me credit for 3.5 miles and 107 flights of stairs. That was in sharp contrast to Horseshoe Bend at 21 flights, just to tell you what you’re up against here. It was truthfully a little more than I was prepare for at this early point. As for my March for Babies campaign, we stand at $1,810 plus $60 per hike towards our $15,000 goal. A long way to go but together we’ll get there. You can join or donate at http://www.marchforbabies.org/youdaman10. 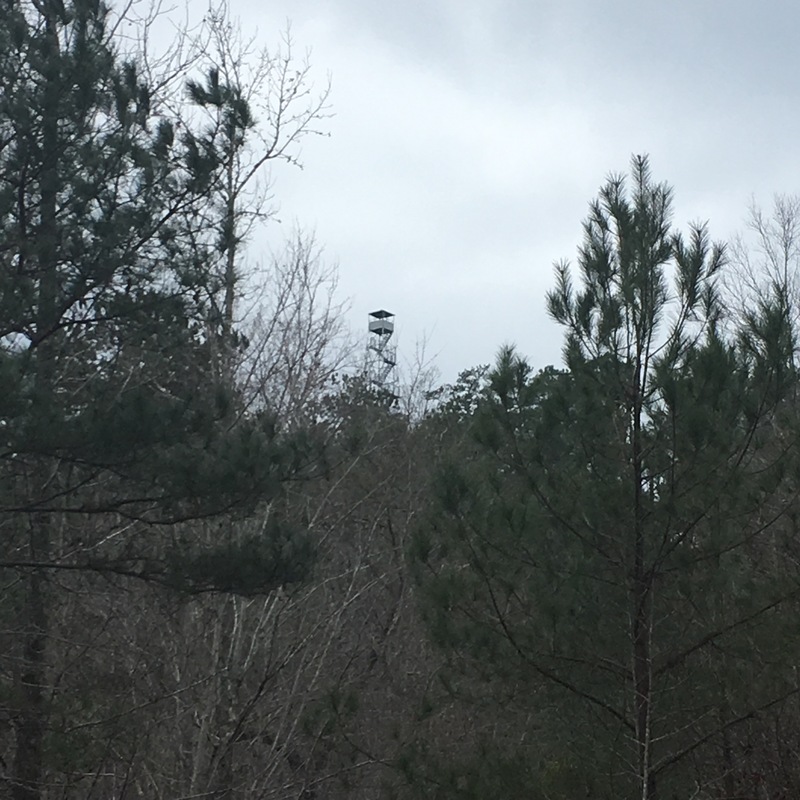 Today’s hike to the Smith Mountain fire tower was short but mostly vertical. The weather was a brisk 31 at the start of the hike and a balmy 35 at the end. I dressed in layers and was glad I did before the hike was over. Not a lot of history to share. 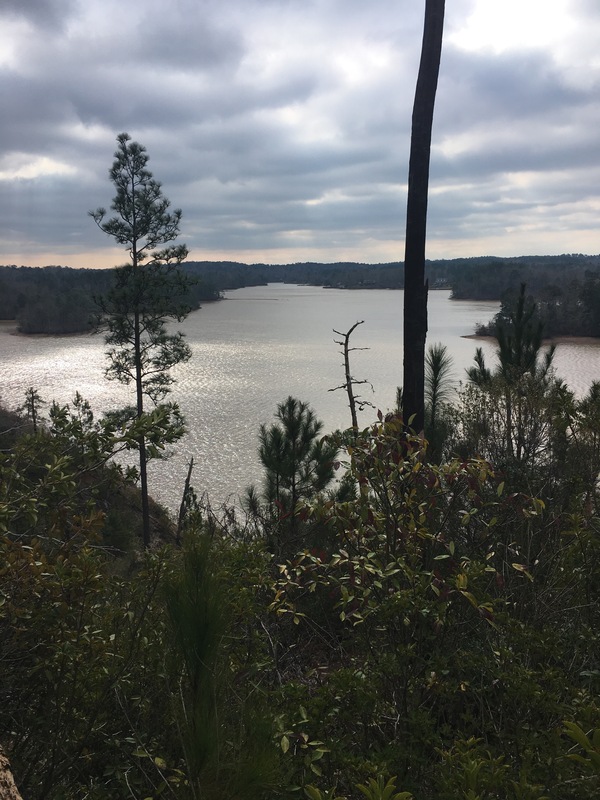 Smith Mountain has an elevation of 780 feet and is the highest point around beautiful Lake Martin. 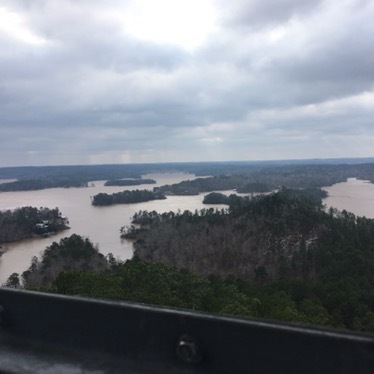 Lake Martin is a huge lake and source of hydropower for Alabama. The Forest Service used a fire tower on top from 1939 to 1980. Afterwards, it fell into disarray. 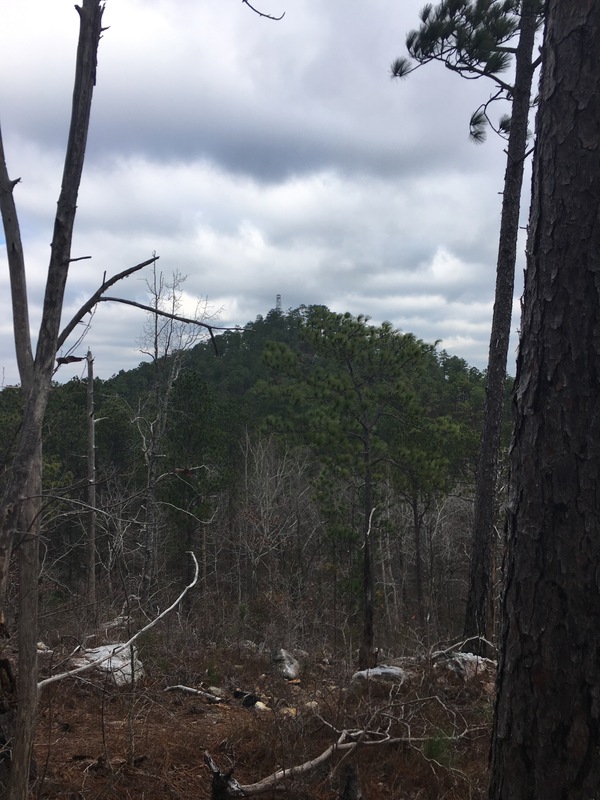 Alabama Power deeded the land to the Cherokee Ridge Alpine Trail Association to build trails and restore the tower. They have done a fantastic job! As for the hike, it was once again listed as moderate in my guide. I learned a valuable lesson today. I had intended to hike another trail in the area. I didn’t find a trail head for the other trail. I did on the other hand find another trail. 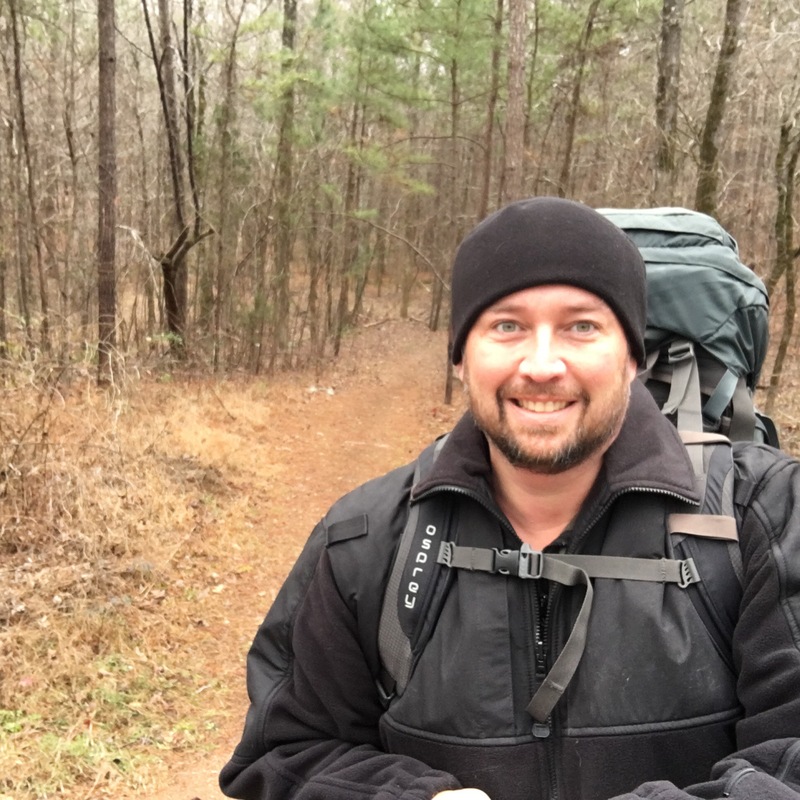 Feeling adventurous, I loaded my pack and headed down the unlabeled trail. My pack weighed in at 42 pounds today due to adding the water that Megan carried last week. Unfortunately, I went in through the out door. I was soon to learn that I was practically mountain climbing to get to the top. The way down, or more correctly the proper way up, was much more gentle. I learned my lesson here – alway stick to the trail head. If I had walked 50 yards down the trail head, there were signs pointing to all the associated trails. I won’t make that mistake again! Please remember that this is a mountain if you take this hike. A mountain by Alabama standards, but a mountain nonetheless. 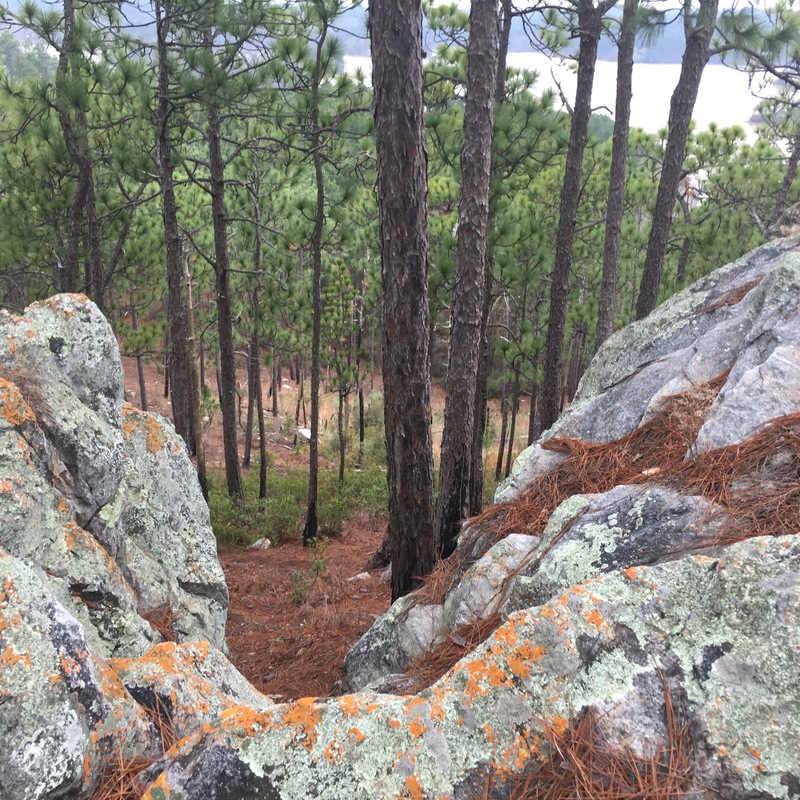 The trail winds through some huge granite outcroppings. The beauty of today was that I was surrounded by the tiniest snow flurries which made my rest stops so very peaceful. Once rested at the top, I had the opportunity to conquer my only significant fear, heights (well heights and mayonnaise 😖). I managed to keep this a secret from Lucy for a long time, the heights thing not the mayonnaise. 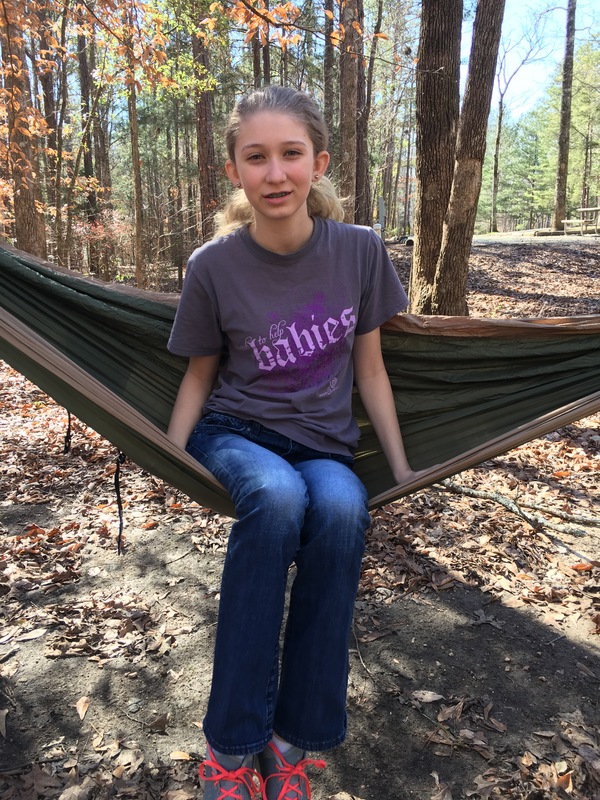 I had to walk over a swinging bridge in Chattanooga and she found me out. I had many opportunities to conquer this fear during my time in the Army. I never like heights but wasn’t about to let 50 18 year olds challenge my manhood, so I always managed. Today I would manage one more time. I decided it would be a shame to walk all this way and not climb to the top. The tower is listed at 80 feet in my guide. If you live local then you know how the wind was ripping today. It was quite intense at 860 feet. The view of the lake and surrounding forest was spectacular. I took a quick picture in every direction before hastily getting down that tower! As for our March for Babies campaign, we stand at $1,760 plus $60 per hike. Our team is working hard toward our $15,000 goal. Please donate or join our team at http://www.marchforbabies.org/youdaman10. We need you! 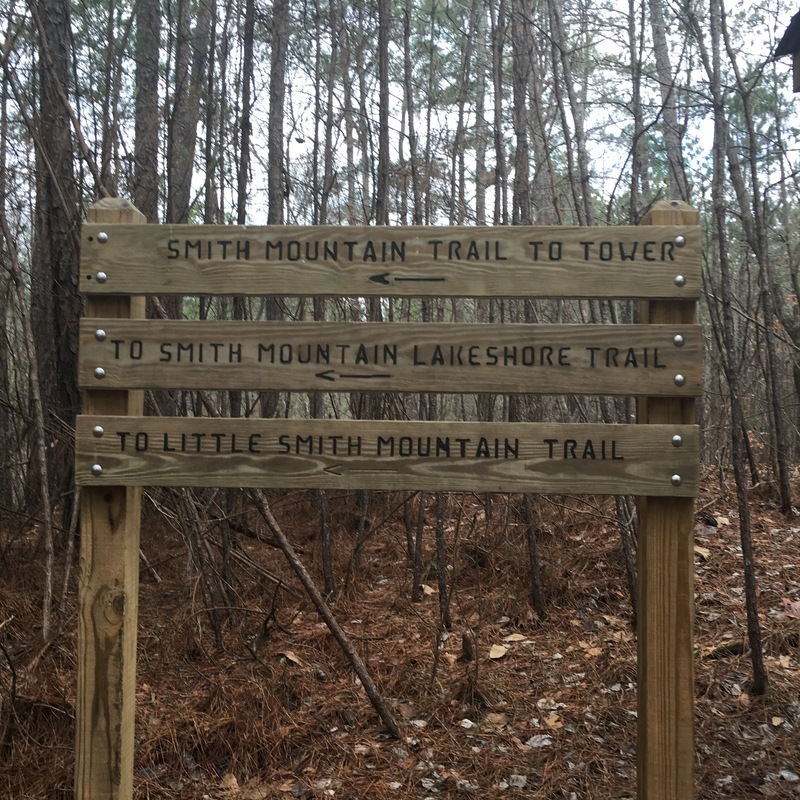 Next up, Little Smith Mountain trail. Horseshoe Bend Nature Trail located just outside (or inside?) New Site Alabama. I’ve never actually made it to New Site, or have I? New Site is a tiny place and I can’t remember. 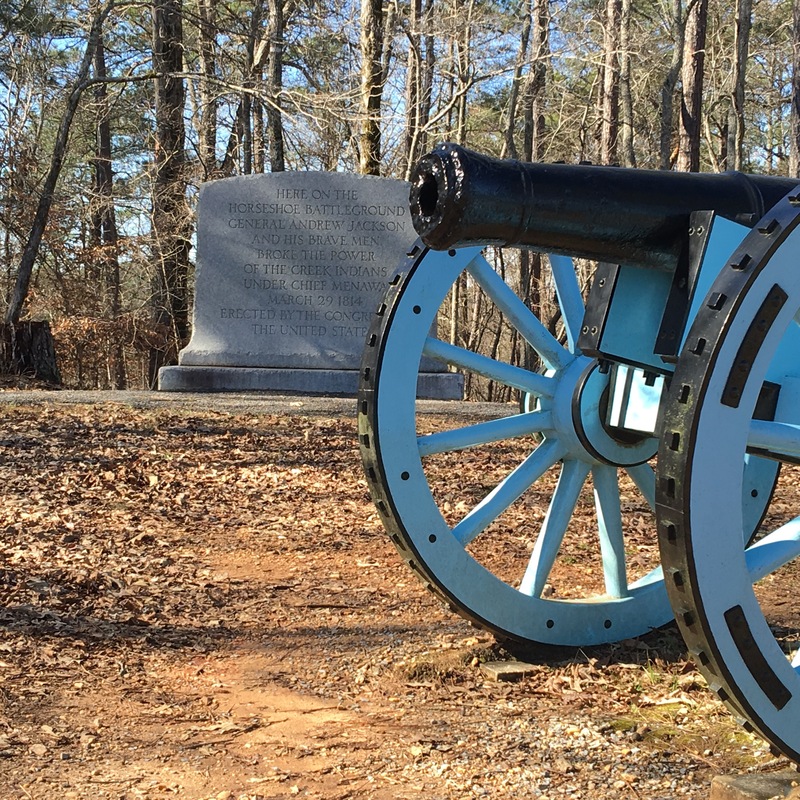 This trail is located inside Horseshoe Bend National Military Park, the site of the last battle of the Creek Indian Wars. I’ve been here several times. This park was a frequent field trip location when I was in grade school, but have I ever really been here? I always took it as day away from school with friends and only half listened to any education that was provided. This site was the last significant camp of the Red Sticks (Upper Creeks). The history is that the Creek nation had split into two groups over how to handle settlers moving into their territory. Upon hearing a false rumor that war had been declared between the U.S. and the Creeks, Red Stick warriors attacked and killed several groups of settlers thereby assuring a conflict that was likely coming regardless. Andrew Jackson was in charge of U.S forces. The war raged for two years without a decisive victory. The Red Sticks, seeking shelter, made a temporary camp at the base of a large bend in the Tallapoosa River. The roughly 1000 warriors built a large fortification at the middle of the horseshoe to defend their families in the camp. Andrew Jackson, with 2000 Tennessee militia and 600 Creek and Cherokee allies made their way to the camp. The Red Stick’s plan was to defeat the U.S. forces directly or at least delay them long enough for the women, children and elderly to slip across the river to their escape. Jackson decided to split his forces moving some units to the mouth of the bend for a frontal assault and others crossed the river and slipped quietly behind the base of the bend thereby effectively surrounding the Red Sticks. 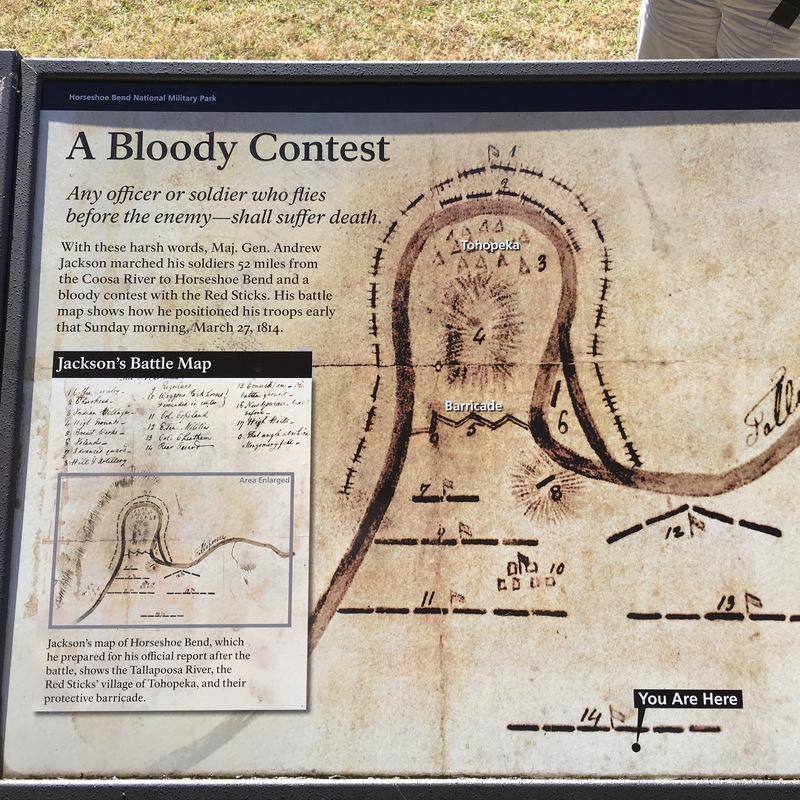 After breaching the fortification with cannon fire, Jackson’s men moved forward while any escaping Red Sticks attempting to cross the river were attacked by the surrounding forces. In the end, 850 Red Sticks and 49 Tennessee militia made the ultimate sacrifice. Jackson was elected President while the captured families were made prisoner’s of war and given to the allied indian groups. Eventually, Creek lands, mostly Mississippi and Alabama, were ceded to the U.S. and the Creeks were relocated west of the Mississippi River. As a child, I think I missed the fact that this is hallowed ground. In a very real sense, this was the ending point of one culture and the beginning of another. It is one thing to send a country’s youth to war, but another thing altogether when that war comes to you, amongst your family – women, children and grandparents. That is what the Creeks faced that day, March 27th, 1814. Ironically that is our anniversary, not 1814 mind you, but 1993. The hike today was an easy 2.5 mile loop according to my guidebook. It had more incline than I was expecting. What was listed as “rolling hills” was made significantly harder by carrying my pack. 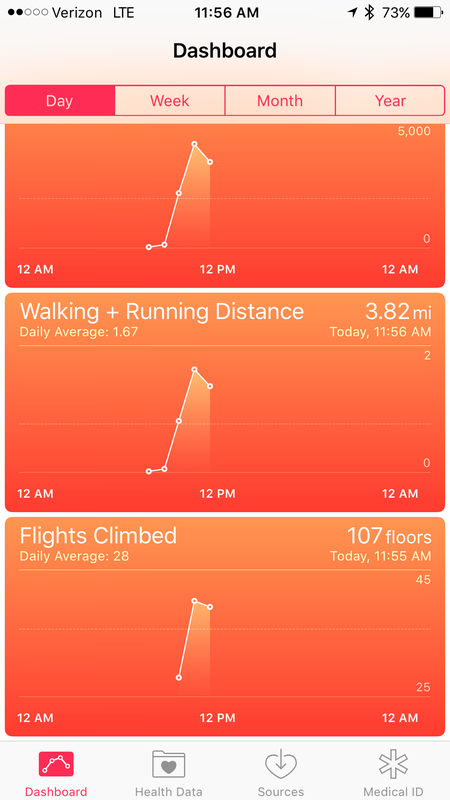 As a reference point, my iPhone gave me credit for 21 flights of stairs. 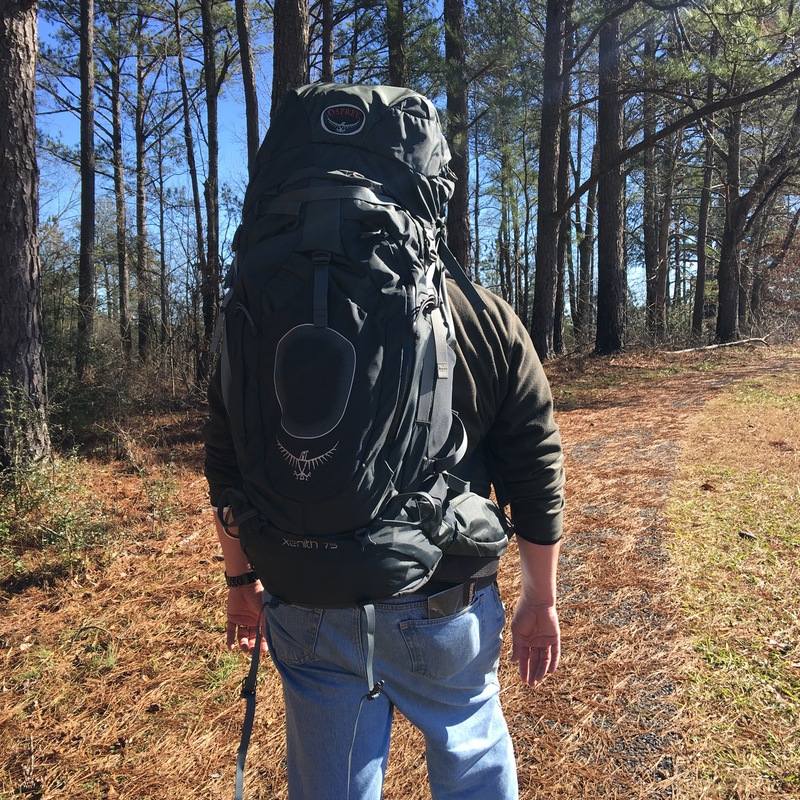 My pack weighted in at 26 pounds and contained almost everything I would need for a weekend overnight trip. It was a challenge but the point was to start tuning up for longer trips. I’ve not carried a pack of any significance since 1994. When I discharged from the Army National Guard, I promised myself that I would never put a pack on my back again. I kept that promise except for two small packs. The first is a small book backpack that I use while traveling. The other is a small pack I fill with comfort items to take to East Alabama Medical Center when a disaster is called, weather or otherwise. There is nothing worse than spending the night away from home without a toothbrush. The woods in the park were as beautiful as they can be in January. The river seemed high and the moss plentiful from the rain we’ve had lately. The trail itself was about four feet wide, well drained and graveled almost entirely making for steady footing. There were several bridges along the trail that all seemed like new construction. It was nice to be outside with my family. As for my March for Babies campaign, we have received 1510.00 plus a major pledge of 30.00 per hike. My goal each year is 15,000, so we have a long way to go. I will keep my toes painted purple until the event on April 16th. You can donate by cash, check, credit card or paypal at http://www.marchforbabies.org/youdaman10 by simply clicking on the “donate” button. You can also click the “walk with me” button to join our team. Everyone is invited to do all three things. Donate, join our team or participate in the #purplepedichallenge. You can go to my Facebook page to see my video (Dennis Thrasher in Auburn Alabama) or search #purplepedichallenge on youtube. Feel free to friend me on Facebook as one can never have enough friends. Up next, Smith Mountain Loop, a place I’ve never visited . . .
Hello all. 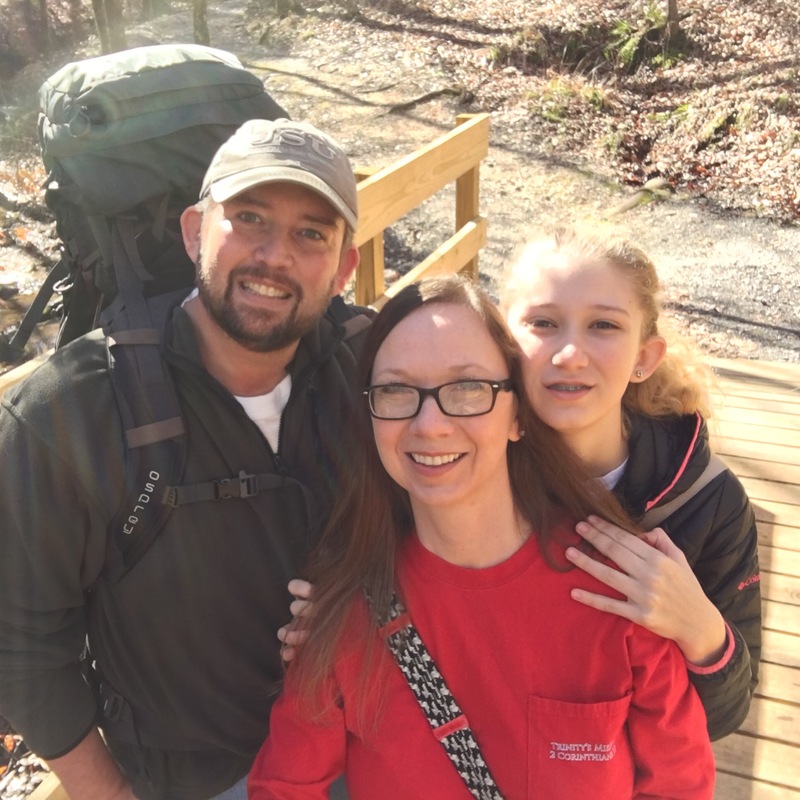 I’m a 47 year old CPA, hospital Vice President and former Army Sergeant that has decided to recapture my youth by participating in the 52 Hike Challenge. 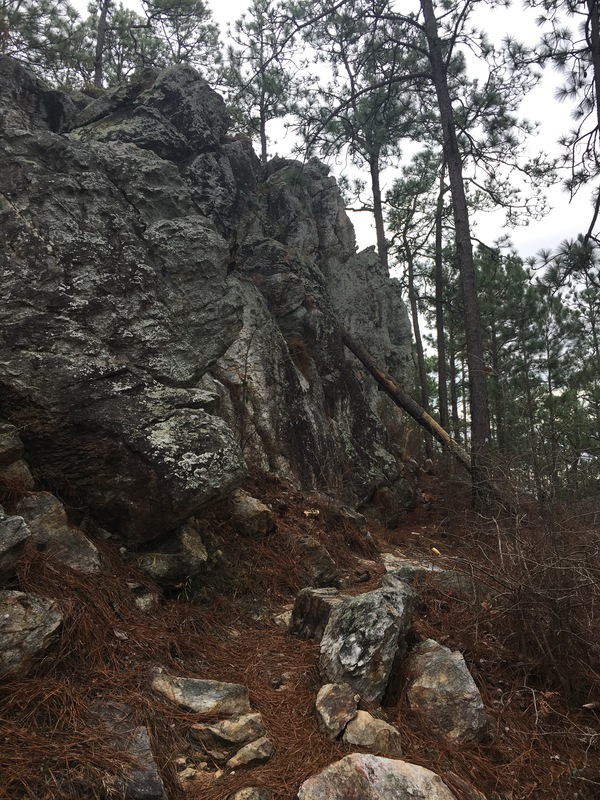 My goal is to complete the best 64 hikes in Alabama. I’m sure this will lead to other adventures outside the state. I hope this will culminate with a 50th birthday trip to Machu Picchu. I’ve wanted to go there since I was a child. I’m currently waiting on a few last items to keep me safe, warm and comfortable before I consider overnight adventures. I plan to start soon on close, day trips to test my equipment. I will be learning to blog along the way.